Actually it is nice to have people smile and say “Merry Christmas!” “Happy Hannukah!” “Happy Kwanza!” or even the politically correct “Happy Holidays!” One thing that makes the holiday season happy is the chance to spend time with your family, both the two and four legged varieties. We want your pet to have a happy, healthy, and SAFE holiday. Keep in mind during this busy time of the year that all this activity can expose your pet to ‘trouble’. It’s important to think ahead and put yourself in the mind of your pet. It’s like having an active toddler in your home, so just one word of warning: anticipate! Candles are a big part of this season, and they can be quite lovely flickering on the table or in the window. But remember, this is something new and enticing in your pet’s environment and chances are they are going to ‘investigate’. Monitor the use of flamed candles carefully. Max isn’t intentionally trying to set the house on fire, but he’s a young golden retriever and when he hops up to look out the window, things do tend to get ‘moved’. NEVER leave candles burning in a room unattended. Electric lights can be a challenge too. For some reason cats and dogs like to chew on wires. If your pet wants to be Tesla or Edison, keep them away from the wires and unplug all the decorations each night. Then there’s the fun of wrapping packages and having the assistance of the family cat. Start your process by wrapping small gifts in dollar store paper just to gauge whether ole Skip Skip is going to lay nearby and occasionally lend a paw, or whether Kitt is going to ‘slip and slide’ across your paper leaving a gaping slice in her wake. You may want to pick a time when Kitt is napping to wrap your special gifts. NEVER let your pet play with rolled ribbon. It only takes a second for them to ingest the shiny ribbon but hours of emergency surgery to get it out! Consider the Christmas Tree carefully. If you choose to purchase a live tree you want to have a base that does not allow your pup to drink the water. Even if you have an artificial tree, you want to make sure that you have stabilized the tree very carefully, possibly anchoring it to the wall. A five pound cat turns into a ballistic missile when that big green thing with all the shiny stuff on it appears in the living room. 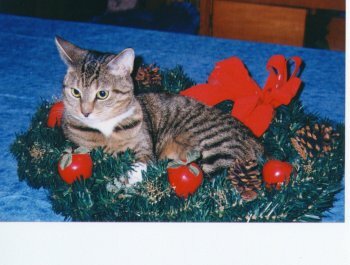 A cat who runs and climbs up the indoor ’cat toy’ can cause the entire symbol of Holiday Glee to crash to the floor. And just like the cat, dogs can find the tree very interesting too. Make sure they don’t consider it ’indoor plumbing’. Happy dog tails and playful cats can raise havoc with priceless antique decorations and risk hurting themselves with broken glass. Protect your more precious ornaments by displaying them securely in a glass case and place some cheap, plastic, “nobody cares if they break“, ornaments on the lower half of the tree in case your pet hears the siren song of ‘play with me’. Be very careful with glistening ‘icicles’ and food related garland like popcorn on the tree as they are particularly mesmerizing to cats and dogs and ingestion of such can cause a bowel obstruction. Stick with artificial garland or let your tree go ‘au natural‘. If a puppy or kitten is part of the holiday gift giving festivities remember, 1)Babies need sleep. 2)Babies have a chewing habit. 3) If babies eat things they are not supposed to you normally wind up at the doctor’s office..
During the holidays things can get rather hectic. Make sure that you keep your pet’s feeding and exercise schedules close to normal. Give them some quiet quality time away from visitors, and always make sure that they have their ‘safe place’ to retreat to when there’s a little too much ‘festivus’ going on. Don’t forget, chocolate and pets don’t mix well. Remember to pick up your pet’s favorite treat, and while you have a Snickers Nutcracker give Max a Milkbone.